128th Street just west of I-5. Workers are ready to pave the new right-hand lane on eastbound 128th Street just west of I-5 in south Everett. If rain delays paving this weekend, it will be rescheduled for the following weekend, Oct. 6-9. Work continues on the guardrail wall separating the new lane from Denny’s restaurant. That will be completed after the lane has been paved. On weekdays, the eastbound right lane will be closed from 9 a.m. – 2 p.m. for the next several weeks. 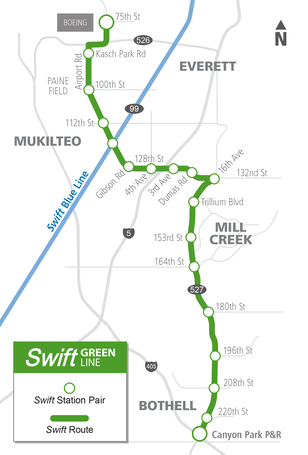 New right lanes are being created on each side of I-5 on 128th Street for the Swift Green Line, scheduled to open in 2019. To date, work on the Seaway Transit Center near Boeing’s main gate has focused on the transit center site or on 75th Street. That will change beginning next week as all lanes of Seaway Blvd. between Hwy 526 & 75th Street will be narrowed and shifted west. The lane narrowing will take place the evening of Oct. 4, weather permitting. This will allow for new curbing and a new bus pullout to be installed on the east side of Seaway Blvd. along the transit center property. Daytime traffic could be impacted as drivers adjust to the narrower lanes and as machines work close to the roadway on the transit center property. 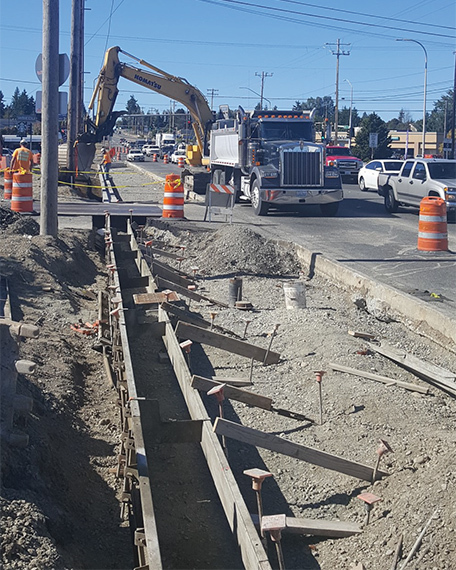 Meanwhile, daytime traffic impacts along 75th Street will continue for the next month as periodic lane closures allow for ongoing trenching and utility work. Community Transit’s Route 105 has been extended to serve Boeing and other nearby customers. Riders can catch this bus at the Everett Transit stops on 75th Street near 16th Avenue west of the PUD substation weekdays during the morning and evening peak hours.